I photographed this jumping spider (family Salticidae) two weeks ago in Buenos Aires, Argentina at La Reserva Ecológica Costanera Sur. In gestalt it is very similar to our North American species of the genus Phidippus, but I can’t say for sure whether it actually belongs to that genus. I found it crawling on the foliage of a tree just about eye height, and I’m guessing from the muted markings and roundish shape to the abdomen that it is a female (I saw another individual later that I took to be a male of the same species – it was similarly but more boldly marked and with a much more tapered abdomen). I hope you’ll forgive my hubris, but I’m rather pleased with how these photographs turned out (although, admittedly, there were others that were not so good). 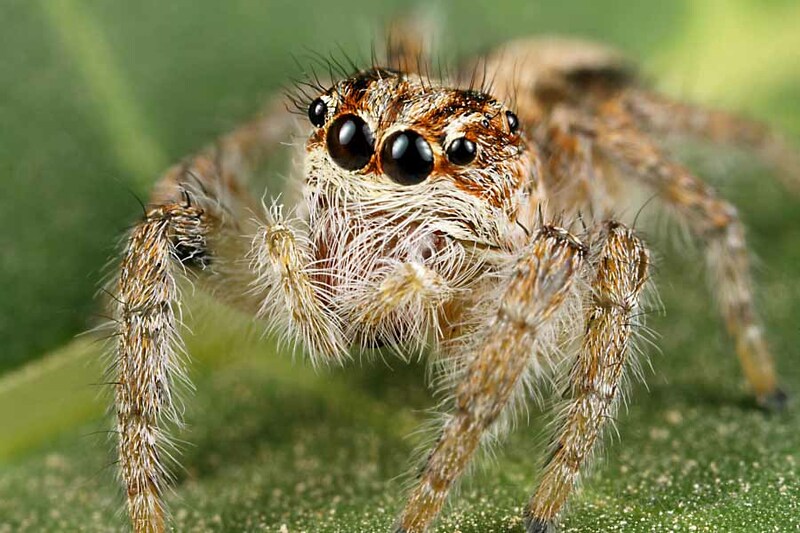 In my opinion, they represent further improvement over my first two attempts at photographing jumping spiders (with the standard caveat that I am still no Thomas Shahan). These improvements involve primarily sharpness and detail but also composition, and I consider them to be largely due to lighting and learning how to handle the subject. The detail in these photos results not only from proper focus, but also lighting techniques. All of these photos were taken hand-held using a Canon MP-E 65mm macro lens at f/13 with full flash lighting. Although I used an exposure setting of 1/200 sec, the actual exposure is determined strictly by the duration of the flash pulse, which is much shorter than 1/200 sec. While flash pulse duration can be set manually (and I started out doing so), I now prefer to use E-TTL mode (Evaluative Through The Lens), which adjusts the flash duration automatically based on the amount of light that the camera senses coming through the lens from a short pre-flash at the aperture chosen. The more light that is sensed, the shorter the flash pulse – the less light sensed, the longer the pulse. Obviously, with a shorter flash pulse there is less likelihood that image sharpness will be affected by movement – either by the subject or by the camera-holder. Since light intensity decreases in proportion to distance, it is desirable to get the light source as close to the subject as possible to achieve the highest intensity and, thus, shortest flash duration. It’s not that simple, however. Most insect macrophotographers agree that diffused light gives better results than undiffused light, but no matter what diffuser one uses there will be loss of light. Loss of light leads to longer flash pulse duration and, thus, increased potential for movement during the flash pulse (especially in hand-held photography). The trick, then, is to diffuse the light as much as possible, while at the same time minimizing light loss. I continue to favor my Puffer+Sto-Fen double diffuser for use with the 65mm lens, because it places the outer diffuser almost right on top of the subject for maximal apparent light size. This is not to say that improvements still are not possible – the open-side design likely results in some loss of light, and a thin inner diffuser film to replace the Sto-Fens would probably further reduce light loss and allow for even shorter flash pulses (and probably also allow a bit more battery life). I’ll get around to effecting these improvements someday, but in the meantime the current setup is working pretty well. Compositionally, I like this last photo the best due to the placement of the subject within the frame (all photos are shown completely uncropped, although I’m not above doing so), its slight upward-looking pose, and the evenly-blurred light-green background. This was achieved by using my left hand to hold the leaf on which the spider was sitting and to also serve as a brace for resting the camera, which I held with the right hand. This minimizes wind-movement and fixes the distance between the subject and the lens (as long as the subject sits still!). By carefully twisting and turning the leaf as the spider moved upon it, I was able to turn the spider into the desired positions, and by paying attention to what was behind the spider I could compose a nicely colored blurred background. 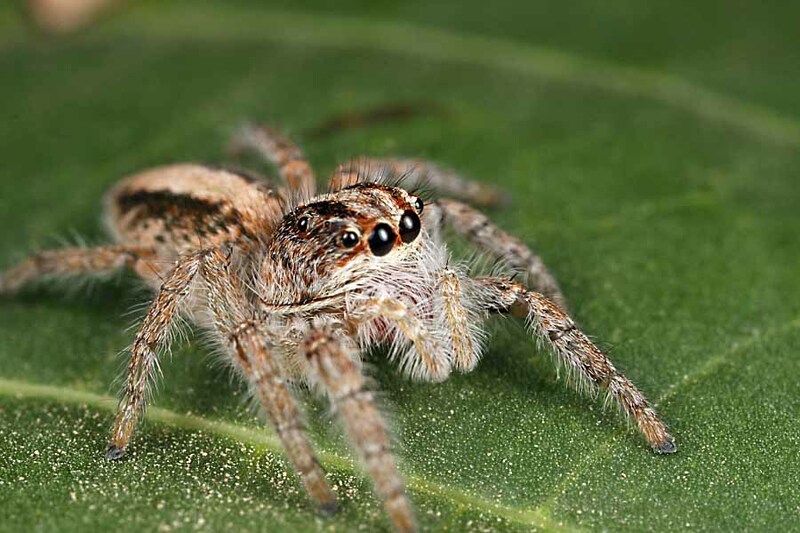 Understanding subject behavior was a tremendous advantage in this case, as it allowed me to predict and anticipate how the spider would move in response to my finger-prodding and leaf turning to get desirable poses. I tend to get my best compositions after I’ve worked the subject for awhile and taken several shots to learn its behavior and get it accustomed to my presences – this is reflected in the accompanying photos, which are posted in the order in which they were taken. Make no mistake – patience and practice are still required. However, it’s techniques such as these that can make the difference between good photographs and great ones! Nice photos. Most likely it is a female “Euophrys” sutrix, which is not a Euophrys nor even a euophryine, but a freyine, so eventually will have another genus name. It is one of the larger species in the subfamily. This species is called “aranhas papa-moscas” in southern Brazil, where it is a principal predator of fruit flies in peach orchards (Wikipedia). This entry was posted in Arachnida, Araneae and tagged arachnids, Argentina, nature, photography, science, spiders, techniques. Bookmark the permalink. I’ve been lucky to have gotten to spend so much this winter in South America. I’m heading into our summer with a bucketload of insect photos still to share! Great shots! Best guess is something in the genus Menemerus. Thanks – any characters that suggest Menemerus, or is it just a general resemblance? Oh, it’s strictly a guess based on gestalt. I am not well versed on Neotropical Salticidae, so I’d take that with a grain of salt. There are numerous species in the tropics, while we have just one in the southern US. Yes, they don’t sit still for long – I’ve found that after working them for awhile they kind of settle down and aren’t so skittish (if they haven’t managed to escape by then!). Those long eyelashes are really quite charming! Yes, eyelashes! That’s what they are! I love love love these little jumpers….so much personality in a tiny little face! Your images are superb! The eyes are so charming and cartoon like, how can a person not love that face! Very nice shots of the salticidae from Argentina. Though I can’t give you direction on what the spider identification is I can be pretty sure it is not Phidippus. 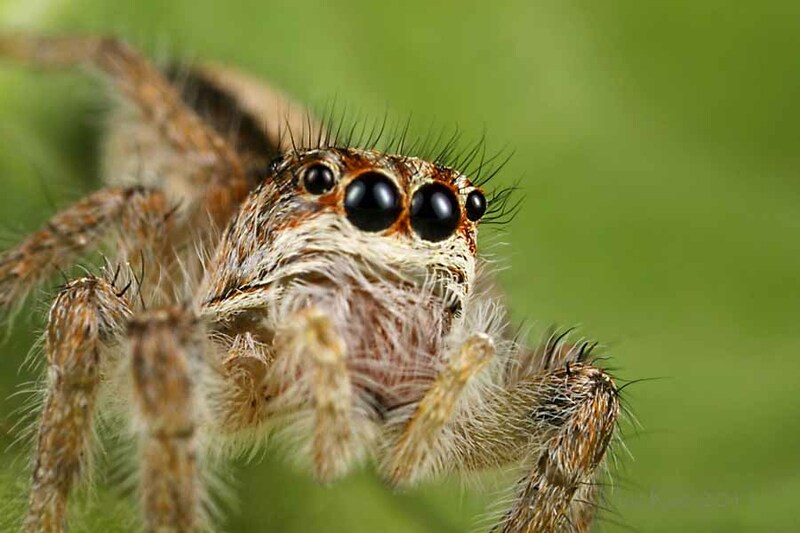 Phidippus ranges primarily in North America and some central America for the most part. you might contact G.B. Edwards of the Florida Dept. of Agriculture for I.D. 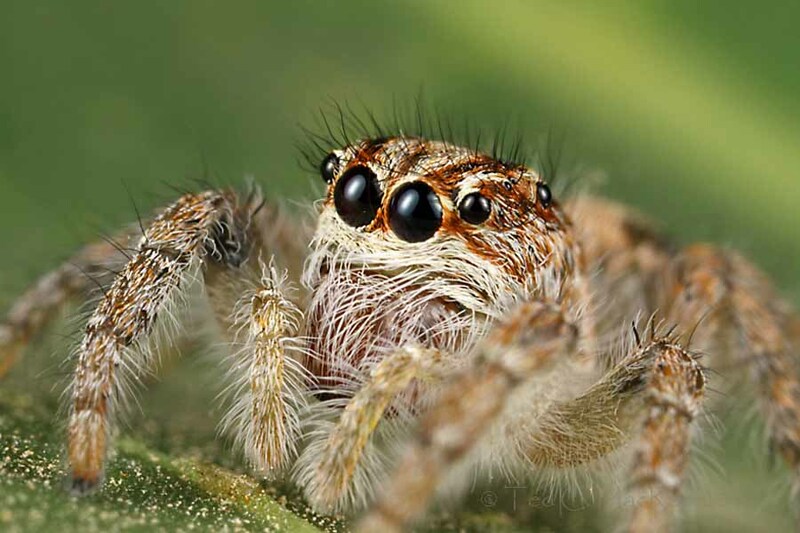 He did a recent revision of the genus and in addition is very knowledgeable of many neotropical salticid’s. Thanks, Joe – I did notice the non-iridescent chelicerae. I’ll see if I can get G.B. to take a look. Wayne Maddison might also have an idea. Nice to see you got an id on this one. OK, I’m slightly embarrassed to admit this, but your explanation about flash pulse duration just cleared up for me why I had some surprisingly soft photos from my recent Costa Rica trip. I never had that happen before, and I was starting to suspect I had done something to damage my equipment. As it turns out, that trip was also the first time I tried using a flash diffuser in the field, so now it all makes sense! I didn’t put two ‘n’ two together myself until I read a post by Dalantech (No Cropping Zone) that discussed flash pulse duration in the context of flash-subject distance. It dawned on me that anything that serves to descrease the intensity of the flash on the subject will increase the duration of the flash pulse. I’m busy working on new diffusers for both the 65mm and 100mm lenses that (hopefully) will diffuse the light well enough but reduce the amount of light lost and, thus, allow shorter flash pulses. I would love to see more of your work..
Gee, thank you very much Cheryl!